4th edition of LI Digital Marketing Awards 2018 is live now. Apply from 50 categories and stand a chance to win LI trophies. Yesterday, we made the Fourth edition of Lighthouse Insights (LI) digital marketing awards live. The online award show along with the industry-favored eBook is delighted to honor your amazing work executed in the year 2017. 28th February, 2018 is the final date for submissions. Online digital marketing awards for brands and agencies. 50 participating categories + 2 special awards category. 1 entry = 1 case study per category. Cost per entry INR 8,000/-. Last year we had 14 categories but this year we have made it 50 categories. This gives an opportunity to a wide variety of brands and an agencies to showcase their work. Below is the list of categories that one can participate. Awarding a B2C digital branding case study with an objective to build and enhance a brand’s image among its target audience. Awarding a B2B digital branding case study with an objective to build and enhance a brand’s image among its target audience. Awarding a digital case study with an objective to generate leads or directly sell a product or service. Awarding a digital case study with an objective to launch a product or a service. Awarding a social cause case study that used digital to build awareness, drive donations or promote social good. Awarding a digital case study that made best use of Facebook as a social network to engage with fans, build loyalty, and tell brand stories. Awarding a digital case study that made best use of Instagram as a social network to engage with fans, build loyalty, and tell brand stories. Awarding a digital case study that made best use of Twitter as a social network to engage with fans, build loyalty, and tell brand stories. Awarding a digital case study that made best use of YouTube as a social network to engage with fans, build loyalty, and tell brand stories. Honoring the best use of video by a brand, agency to distribute, connect and communicate with an audience. Videos must be 2 or more minutes long in length to qualify. This award honors the most effective and creative use of medium-length video in a digital media marketing campaign. Videos must be 1-2 minutes in length to qualify. This award honors the most effective and creative use of short form video in a digital media marketing campaign. Videos must be less than a minute in length to qualify. This award honors the most creative and effective use of a video pre-roll by a brand, or agency. This award honors the most creative and effective use of virtual reality in a digital marketing campaign by a brand or an agency. Honoring the best use of 360 video by a brand, agency to distribute, connect and communicate with an audience. This award honors digital campaigns that incorporate Facebook Live or overall brand presence on Facebook Live by a brand or an agency. This award honors digital campaigns that incorporate video on Facebook or videos included in a brand’s overall presence on Facebook by a brand or an agency. 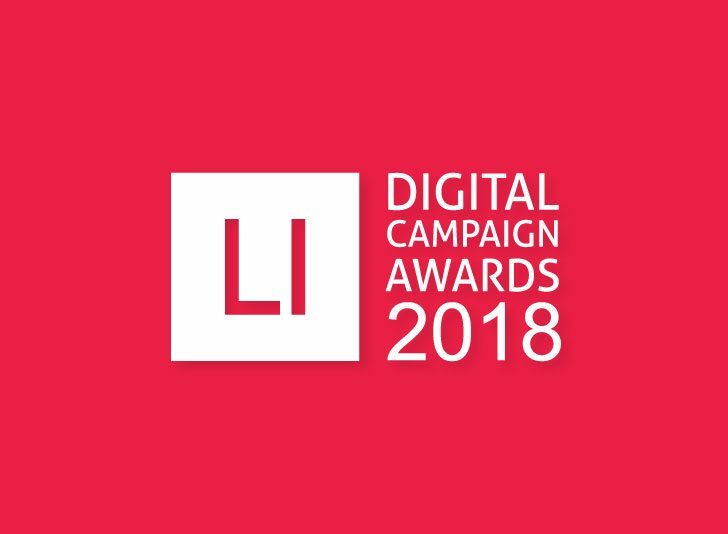 This award honors digital campaigns that incorporate video on Instagram or videos included in a brand’s overall presence on Instagram by a brand or an agency. This award honors digital campaigns that incorporate video on Twitter or videos included in a brand’s overall presence on Twitter by a brand or an agency. Best use of real time streaming video (Facebook Live or Periscope or other) by a brand, agency to connect and communicate with an audience. Honoring the most innovative and effective use of content generated by fans for increasing brand awareness. Awarding the best B2C content marketing campaign with an objective to launch a product or engage consumers with the help of a blog, microsite, landing page, etc. Awarding the best B2B content marketing campaign with an objective to launch a product or engage consumers with the help of a blog, microsite, landing page, etc. Awarding the best ongoing, long term branded content series by brand or an agency. This award honors those most effective and creative use of emojis by a brand, agency or agency. This could be for a news event or cultural phenomenon or part of a larger marketing campaign strategy. This award honors the best use of animated GIFs by a brand, or an agency to meet its business objectives. Awarding the best use of native advertising or sponsored content across multiple platforms to promote a brand, product or service to consumers. Awarding a digital case study that created innovation by integrating tech to engage fans and solve a brand problem. Awarding a digital case study that created innovation by reaching out to millennials in a fun and meaningful way to deliver a brand message and create loyalty. Awarding a digital case study that created innovation by integrating real time marketing to achieve brand objective. Awarding a digital case study that used influencers to drive the brand message to its desired target audience and delivered results. Awarding a digital case study that was driven via mobile to deliver a brand message. Awarding a digital case study that integrated offline and online innovation while delivering a brand message. Awarding a digital case study for the most creative campaign spanning effectively on multiple digital and social media platforms. This award honors the best use of digital media by an auto brand to meet its business objectives. Objectives may include crowd-sourced concept and design, customer engagement, events and promotions (online & offline), and building a loyal community, among others. This award honors the best use of digital media by a beauty brand to meet its business objectives. Objectives may include promoting the launch of a new line or service, elevating a brand’s presence through digital and sharing tips and best practices with current and potential consumers. This award honors the best use of digital media by a fashion brand to meet its business objectives. Objectives may include promoting the launch of a new line or service, elevating a brand’s presence through digital and sharing tips and best practices with current and potential consumers. This award honors brands and organizations in the financial services industry that use social and digital media in the most effective and creative ways to create a positive and seamless experience for existing users and gain trust and loyalty from potential users. Money management and financial services are eligible for this award. This award honors brands and organizations in the banking services industry that use social and digital media in the most effective and creative ways to create a positive and seamless experience for existing users and gain trust and loyalty from potential users. Banks are eligible for this award. Tourism boards and services as well as travel and transportation brands and publications will be eligible for this award. Objectives include gaining consumer trust, improving loyalty through promotions and deals and excelling in customer service. Real estate brands, and agencies are eligible for this award. Objectives include exclusive deals to incentive social sharing, engaging existing customers and driving new traffic. This award honors brands and organizations in the insurance sector who use social and digital media in the most effective and creative ways to create a positive and seamless experience for existing users and gain trust and loyalty from potential users. Retail and e-commerce brands and e-commerce platforms are eligible for this award. Objectives include exclusive deals to incentive social sharing, engaging existing customers and driving new traffic. Restaurants and other dining establishments are eligible for this award. This award recognizes the best efforts of restaurants to build consumer trust, share promotions, and improve the overall customer experience using digital marketing. Awarding a digital case study that drove innovation during an event or movie promotion. Awarding a digital case study that drove innovation during a television show or series promotion. Companies specializing in healthcare and pharmaceutical, or fitness are eligible for this award. Objectives may include developing and delivering product information to target audiences, creating shareable content on health and wellness, or building support for a health-related cause. This award recognizes the most effective and creative use of digital media by publishers to enhance and/or revolutionize their customer experience. This is a special award where Lighthouse Insights will recognize one agency as the best digital marketing agency. This is a special award where Lighthouse Insights will recognize one brand as the best digital marketing brand. 2. Do provide screenshots for the results achieved and relevant campaign images as separate attachments in the email. 3. If you have video case studies then provide us the YouTube link. 4. Make sure you submit your entries by 28th February, 2018 end of day. 1. This is an online event and open for brands and agencies. 2. Entries need to be submitted only in Word doc format. Any other format will not be accepted. 3. Share relevant images as a separate attachment. Don’t include in the Word document. 4. Time frame for submitted work is for last 12 months. For further queries you can reach out to me: connect[at]lighthouseinsights[dot]in/ +91 9503460626.